WILMINGTON, Del.--(BUSINESS WIRE)--Gulftainer, the world’s largest privately-owned independent port operator and logistics company based in the United Arab Emirates, finalized a 50-year concession agreement with the state of Delaware to operate and develop the Port of Wilmington, significantly expanding the company’s global footprint and reach. The agreement, signed by Gulftainer’s subsidiary GT USA, will see an expected investment of up to $600 million in the port to upgrade and expand the terminal and to turn it into one of the largest facilities of its kind on the Eastern Seaboard. At a public signing ceremony held in Wilmington, Gov. John Carney of Delaware signed the agreement with Badr Jafar, chairman of the Executive Board of Gulftainer, in the presence of Delaware Secretary of State Jeffrey Bullock and other state officials, as well as H.E. Yousef Al Otaiba, the UAE Ambassador to the United States, and other dignitaries. The 50-year concession follows a year of negotiations and a thorough evaluation of Gulftainer’s capabilities globally, including in the United States, where it operates the Canaveral Cargo Terminal in Port Canaveral, Fla., and provides services to the U.S. Armed Forces as well as the U.S. space industry. The Delaware concession agreement completes a preliminary agreement between Gulftainer and the state of Delaware, as well as the completion of a formal review by the Committee on Foreign Investment in the United States (CFIUS), granting Gulftainer exclusive rights to manage the port. Gov. 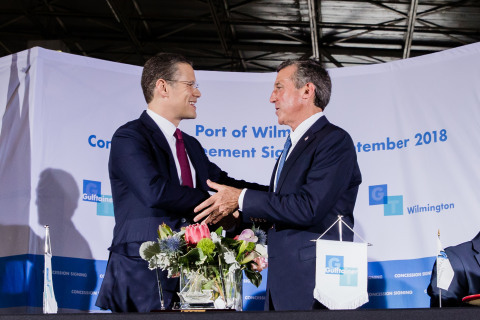 John Carney, governor of the state of Delaware, said: "This historic agreement will result in significant new investment in the Port of Wilmington, which has long been one of Delaware's most important industrial job centers. For decades, jobs at the port have helped stabilize Delaware families and the communities where they live. I was proud to help make our partnership with Gulftainer official today, and I want to thank members of the General Assembly, the Diamond State Port Corporation, Gulftainer, and all of our partners who have helped make this agreement a reality." Gulftainer plans to invest up to $600 million in the port, including $400 million on a new 1.2 million TEU (twenty-foot equivalent units) container facility at DuPont’s former Edgemoor site, which was acquired by the Diamond State Port Corporation in 2016. Plans for the port also include development of all cargo terminal capabilities at the facility and enhancement of its overall productivity. Gulftainer also will establish a training facility at the development site specifically for the ports and logistics industries that is expected to train and upskill up to 1,000 people per year. The Port of Wilmington opened in 1923 and is a fully serviced deep-water port and marine terminal strategically located on 308 acres at the confluence of the Delaware and Christina rivers. It is the top North American port for fresh fruit imports into the United States and has the largest dockside cold storage facility in the country. The relationship between the United States and the UAE has long been underpinned by a shared commitment to promote strong trade and investment ties. In recent years total bilateral trade between the UAE and the United States has grown from approximately $5 billion in 2004 to over $24 billion in 2017. The United States had a $15.7 billion trade surplus with the UAE, its third-largest trade surplus globally. GT USA is the U.S. division of Gulftainer, the world’s largest privately-owned independent port operator and logistics company with operations and business interests in the Middle East, the Mediterranean, Brazil and the United States. The company signed a 35-year agreement with the Canaveral Port Authority in Florida, marking Gulftainer’s first venture in the United States. In addition to containers, Canaveral Cargo Terminal also handles heavy equipment, vehicles and boats as well as breakbulk, lumber and heavy lift cargo. GT USA also manages a 40,000 square-foot warehouse at Port Canaveral. GT USA is located at 445 Challenger Road, Suite 201, Cape Canaveral, Fla. 32920. For more information, go to www.gulftainer.com/US. Port of Wilmington to receive $600 million investment and expansion in Gulftainer's 50-year concession agreement with state of Delaware.